We decided to walk in Ireland almost by accident. I had to fly to New York for a conference, and as I was perusing airline flights, I noticed it would be cheaper to fly on to Shannon Airport, in Ireland, than it would be to come back to Spokane—the nearest airport to Sandpoint. I have to admit this choice did not save any money, but it did lead to a wonderful walk. Walking is a great way to get to know a country. Natural surroundings and historical and cultural sites pass by slowly—unlike in a bus or train—and there are many opportunities to talk to the locals. Of Ireland’s hundreds of marked walking routes, called “ways,” we chose the “Beara Way” in the southwest because of its relative obscurity. Over a 10-day period in late April and early May, we saw only three other walkers—a Dutch man and his two teenage sons. From Shannon we took a bus to Cork, where we had our initial encounter with legendary Irish friendliness. We asked a woman at the bus station for directions, and she had difficulty describing the route through Cork’s ancient and convoluted streets. So she simply walked with us to our hostel. Two days later, a small bus took us on to Glengarriff, the jumping-off point for our hike. Here the equally friendly Siobhan at the Blue Pool Hostel was happy to store our extra luggage while we made the trek with light packs. 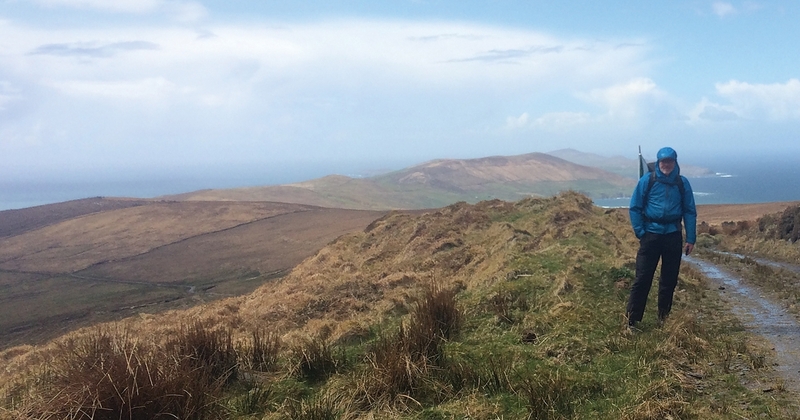 Like Ireland’s other walking routes, the Beara Way has numerous options for starting and ending points, and the hospitable and accommodating hosts along the route make it possible to do anything from a series of short hikes with only a daypack to longer days with full packs for camping. Villages are within a day’s walk of one another, and each has at least one welcoming pub where you can get dinner and at least one place you can stay (although some villages are so small that they have only one of each). We stayed in rooms in people’s homes (AirBnB’s), small hotels, and hostels. Our main challenges were mud and the Full Irish Breakfast. The former caused a painful slip and slide for me on our first day, but our host that night was happy to drive me to our next village the following day, so I could recover. On our first encounter with the Full Irish Breakfast, we were fortunately in the company of the two Dutch teenagers, who were more than willing to absorb what we two elders could not. After that, we took to asking for a Half Irish Breakfast. A typical day’s hike took us over dozens of stiles as we crossed from one fenced field to another, through high green meadows, and on narrow lanes closely hemmed with stone walls. Sheep were everywhere, although they and their numerous adorable lambs inevitably scattered at our approach. The Atlantic Ocean was often in view and never far. Ubiquitous stone circles and standing stones reminded us that we were a millennia later than the first humans to pass here. At the end of the Beara Peninsula, a six-person (or two-cow) cable car provides passage across a narrow straight to Dursey Island. The island has no tourist facilities and so was a day trip for us, although our Dutch friends were able to camp within the stone walls of a long-abandoned farmhouse at the very tip. With high clouds, high wind, familiar mud, occasional sunshine, and nothing but New York off in the unseeable distance beyond, this point at the western end was a highlight of our journey. Detailed maps and information about routes and accommodations are available at www.activeme.ie or www.irishtrails.ie.